Shahrin Ahmad - The Shahgazer of the Orient. I had been imaging the night sky with my own equipment in a home observatory located north of Pittsburgh, Pennsylvania, USA for about 7 years prior to trying Global-Rent-A-Scope (GRAS, the predecessor of iTelescope). I had the usual problems, limited clear nights, equipment issues, increasing light pollution in my suburban neighborhood and encroaching treetops obscuring my visible horizon. 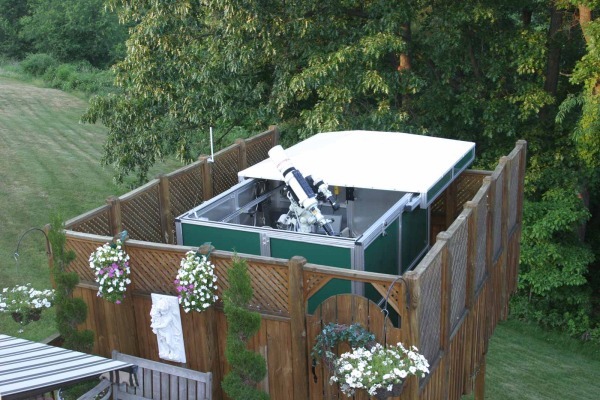 The observatory was built on an extension of my backyard deck over the objections of a very understanding spouse and the acceptance of tolerant neighbors. It had reached the point where it was difficult to image anything but narrowband targets. Then I tried iTelescope (then GRAS). Using the iTelescope systems, I had the potential to image on most nights using equipment superior to my own, under ideal sky conditions, and with the ability to access targets in another hemisphere or those too close to my home horizon . I have been a member of iTelescope for almost 3 years and have been very happy using the service to supplement my local, home imaging. I guess the reasons I like iTelescope are the same as those of most members; that was until the Fall of 2012. That was when iTelescope became the answer to the "imperfect" storm. It all started with a flash of lightning and a crack of thunder. On that night my home observatory suffered a significant electrical strike. Although it was probably not a direct hit, it was close enough to damage my Takahashi NJP mount circuit board, declination encoder and right ascension motor. And because the mount had recently been discontinued by Takahashi, the parts could not be replaced but had to be shipped to Japan for repairs. In addition to the damage to the mount, my Starlight Xpress Lodestar guide camera was inoperative and had to go back to Great Britain for repair. Because of the long estimated repair time required for the mount, I purchased an identical, used NJP mount on Astromart and used my Starlight Xpress SXVF-H9 ccd camera as a guide camera. If you are ever told that lighting doesn't strike the same place twice; don't you believe it! Six weeks after the first lightning strike, the observatory was hit again. 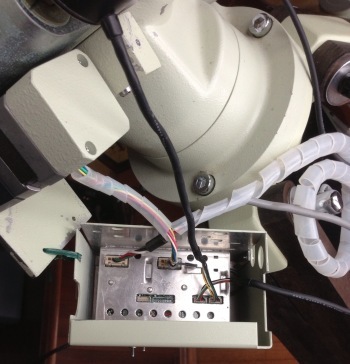 The second NJP mount was damaged just as before, as was the SXVF-H9 ccd camera. This time the observatory computer and a heavy duty surge protector (added after the first lightning strike ) were also ruined. I had no mount and no idea how long it would be for the repairs to be made. Then another problem arose. I was stricken by a cervical disk herniation that left me with intractable pain and arm weakness. While recuperating I suddenly had an epiphany. Why deal with all these problems when there is iTelescope? Over the following months I slowly sold off most of my astronomical equipment including the observatory itself. Happily, the sales generated enough cash to pay for a badly needed new deck (minus the observatory). This brought harmony back to my marriage. Now I can sit on my new deck, enjoy the view of the trees that used to be a source of frustration, and image using my iPad. My neck also appreciates not having to move all that heavy equipment around. Thanks iTelescope, the answer to the "imperfect" storm.